Senator Keith Clouden, who represents farmers in the Upper House of Parliament, joined 2 other National Democratic Congress (NDC) senators and walked out from Tuesday’s sitting, protesting the decision by President Chester Humphrey that Nazim Burke’s contribution to the Hydrocarbon Incentive Bill was not relevant to the debate. 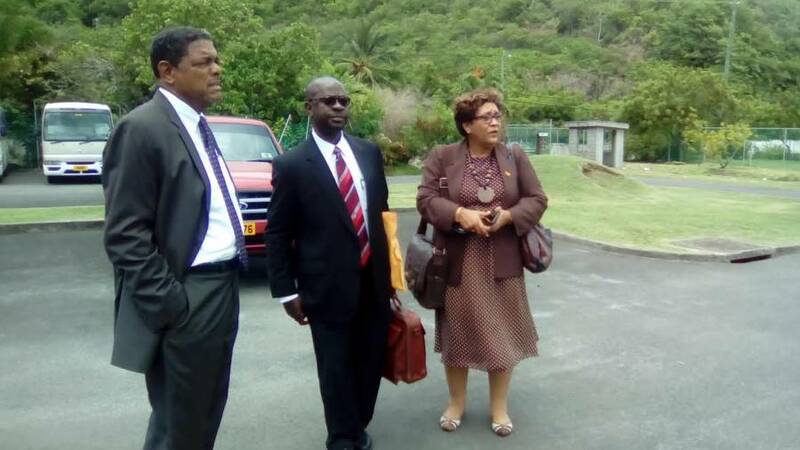 The incident happened after President Chester Humphrey accepted the “point of relevance” concern raise by Leader of Government Business Senator Simon Stiell, that Burke’s contribution to the Hydrocarbon Incentive Bill was not relevant to the Bill. Burke, however, raised arguments showing justification, but in the end, Humphrey told him that he had to agree with Stiell that his contribution was not relevant, to which Burke responded by saying he would say nothing further on the Bill. Senator Humphrey responded, “If you have nothing to say, take your seat.” Not only did he take his seat, but Burke decided to pack his bags and walk out. He was joined by Senator Franka Bernardine who represents the NDC and Keith Clouden who represents farmers. The 3rd NDC senator, George Vincent tendered an excuse for today’s sitting, and was not in attendance. Clouden told reporters who chased after them to confirm that it was a protest walk-out, that his action was indeed a protest to the treatment of Burke during the debate. “Yes, I am protesting,” he said before deciding not to speak further. Labour Senator Ray Roberts within a few minutes went to speak to them and indicated that he would not leave. As a result, he missed his opportunity to make his contribution during the 1st reading of the Bill, and made a limited contribution during the 3rdd reading. The 3rd reading concerns mainly for amendments to a Bill. Roberts recommended that the Bill — which provides for investors’ employees to not make National Insurance Scheme (NIS) contributions — be allowed and that incentives should only be provided to investors whose investment is beyond EC$80 million. The Hydrocarbon Incentive Bill which was approved by the House of Representatives earlier this month, seeks to provide incentives for companies that will be engaging the hydrocarbon exploration. (b) the quality, quantity or composition of crude oil or natural gas extracted from a natural deposit in the State of Grenada, and excludes an investment that generates any profit from a transaction involving crude oil or natural gas, or any product of crude oil or natural gas, extracted from the State of Grenada. To qualify for the incentives, a company should have investment in an amount according to the bill, not exceeding $50 million. for the purposes of a qualifying investment. With regards to Income Tax the investor shall not apply income tax in respect of any income accrued by a non-resident individual in respect of services rendered for the purposes of a qualifying investment. For Value Added Tax incentives, the Bill said that for the purposes of the Value Added Tax Act, Chapter 333A, services rendered by a non-resident individual for the purposes of a qualifying investment shall be zero-rated.